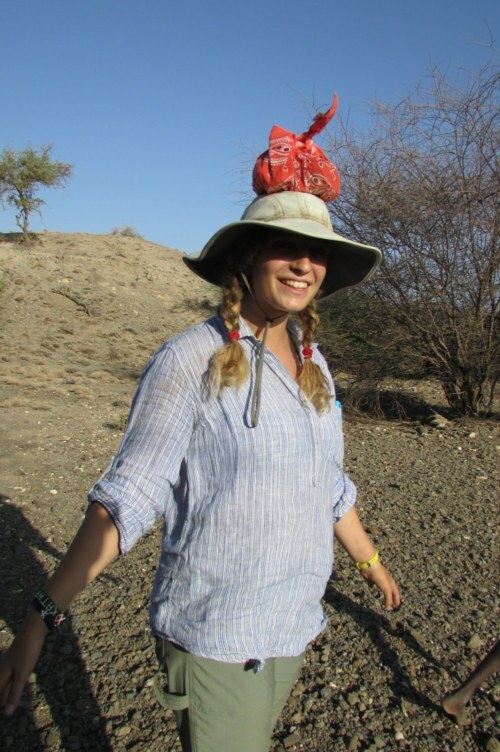 We left TBI Turkwel Monday morning for our camping trip, from which we would be returning on Wednesday afternoon. 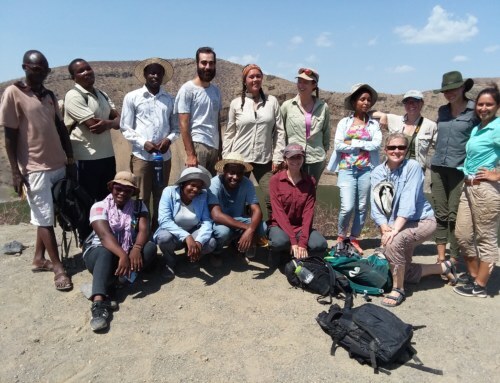 We would be camping for two nights near the village of Nariokotome; the famous hominin site of Nariokotome boy, KNM-WT 15000, is only a few minutes away! 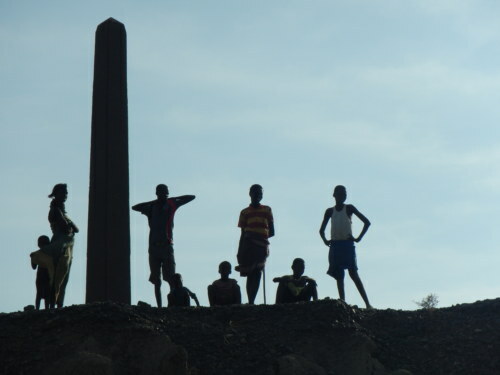 On our drive to Nariokotome, we would be making two stops: first, at the Kalokol Namoratunga pillar site, and second, at Lomekwi 3! 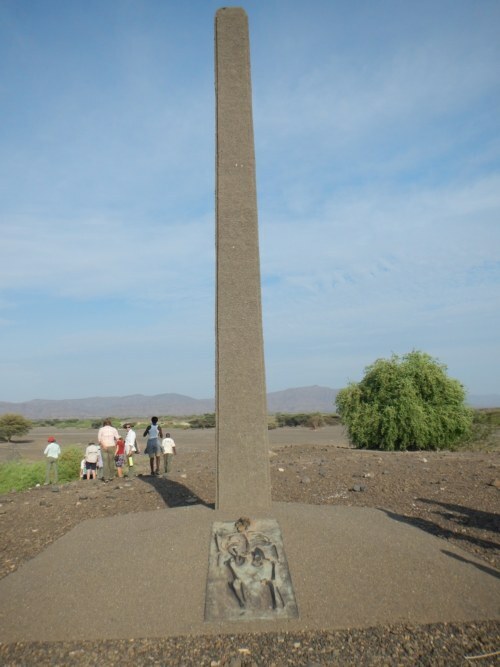 The Kalokol Namoratunga site is one of several megalith sites in the Turkana Basin. There are many large, pillar-shaped rocks standing upright in a cluster. 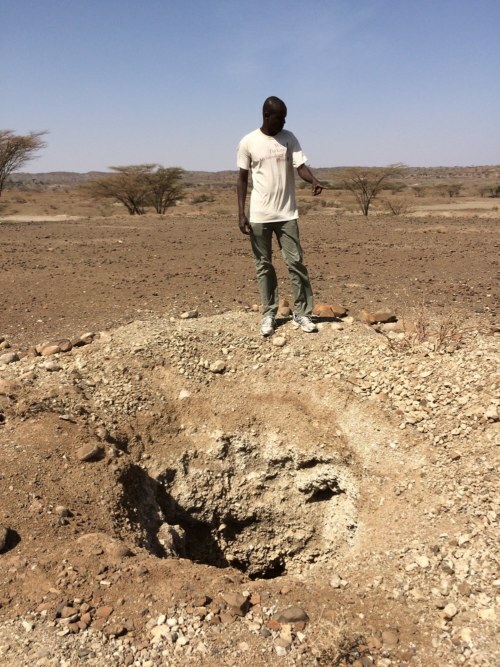 Though the exact purpose or construction mechanism is unknown, there is a local myth concerning the many Namoratunga sites in the Turkana Basin. According to the myth, many many years ago, a group of people were singing around a campfire. The devil appeared and wanted to sing with them, but told them they had better not laugh at his voice. When he began to sing, they couldn’t help but laugh, some doubled over or leaning back they were laughing so hard. Filled with anger, the devil turned them all to stone just as they were, and this is why some stones are straight up while others are leaning over. Dr. 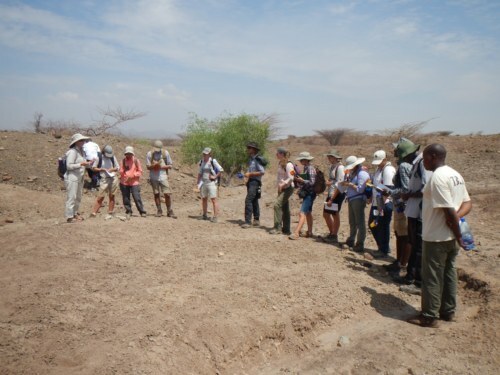 Professor Harmand talks to the students about past excavations that took place here. 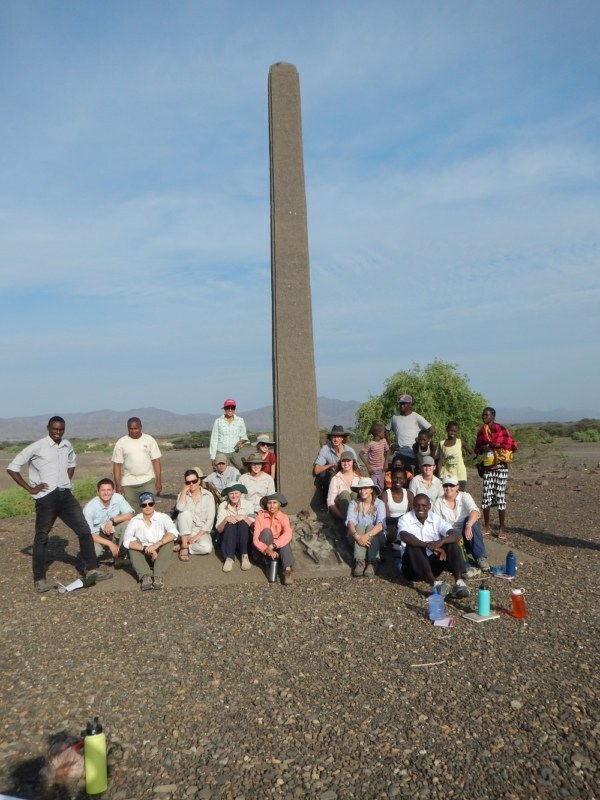 Toby explains to the students what he learned about this pillar site after doing research for his project! 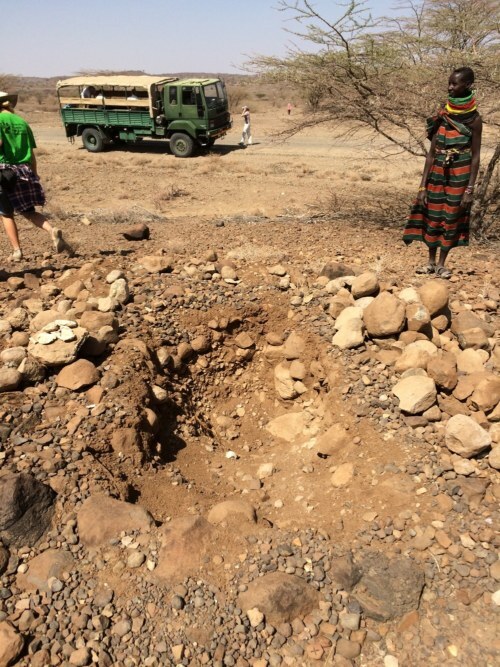 Unfortunately, this site has been severely damaged over the past several years—people have come in the middle of the night and dug up stones, looking for precious minerals or treasures underneath them, or thinking the stones themselves may be valuable (they actually have little direct monetary value, as they are large basalt pillars). Area near the site that was damaged. This hole was about 1.5m deep! 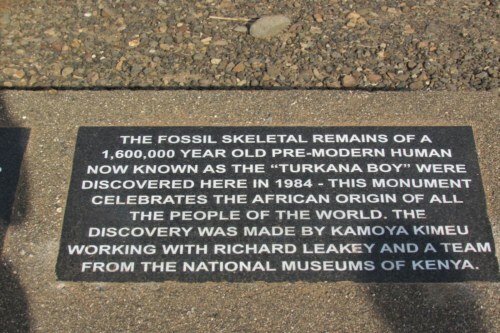 It was very sad to see the leftover damage of the fossils. 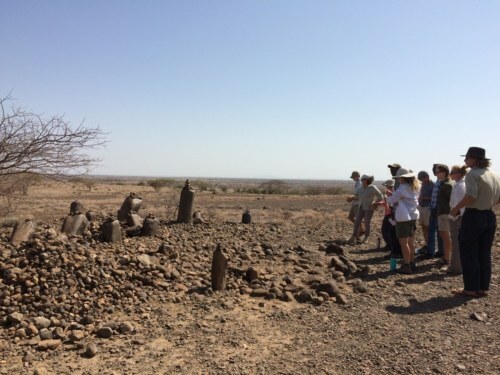 Our next stop was at the Lomekwi 3 site, the oldest stone tool site in the world! Because this is still an active excavation, Dr. Professor Harmand had us walk very carefully and follow her path exactly so as to not disturb anything. 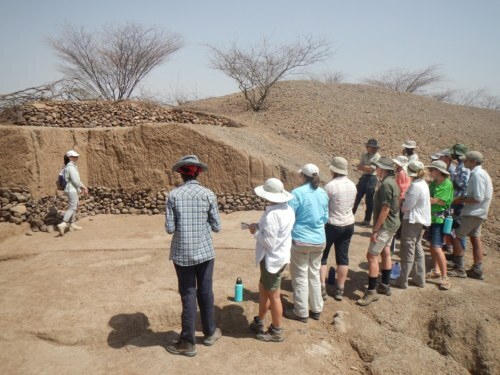 At the site, she explained their excavation progress and findings, and the direction they will take in further excavations. 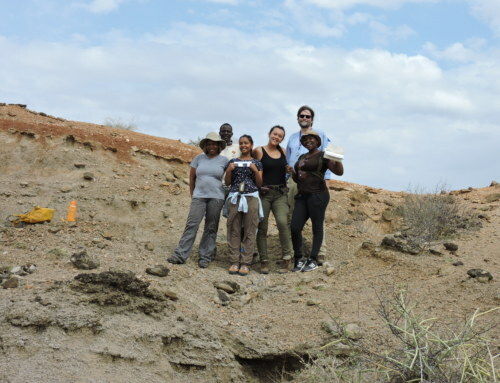 Additionally, we visited the hill her discovery team had climbed the day they first decided to survey this area. Dr. 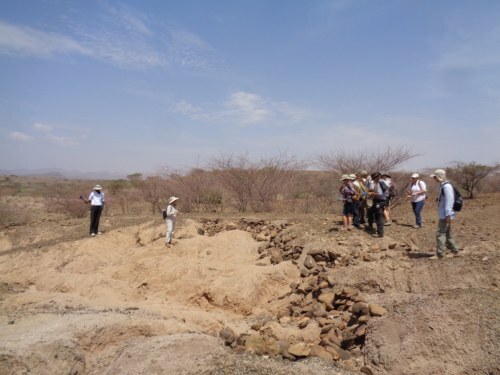 Professor Harmand discusses the excavation at Lomekwi 3! In this area, there are still several Lomekwian tools on the surface that have eroded out from layers of sediment. Though it was amazing seeing the Lomekwian tools in the lab, there is a distinct feeling of awe and veneration when seeing the oldest stone tools in the exact area they were left 3.3 million years ago, where some hominin (there is still an active debate as to which hominins may have made and used the Lomekwian tools) made and used each tool, at this very place. It is a truly humbling thought, to imagine how far our technologies have come and to see firsthand, where they began. Dr. 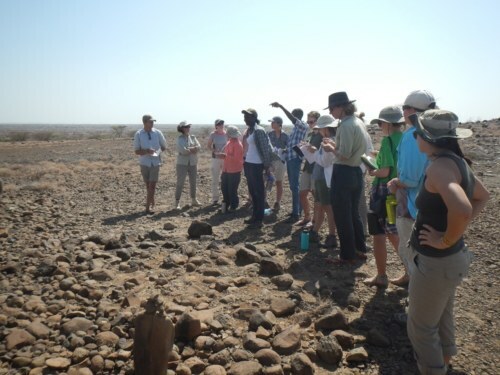 Professor Harmand teaches the students about the stone tools at Lomekwi 3 as the students pass around one they discovered on the surface. We arrived at camp right before five, with plenty of sunlight left to set up our tents and go to the nearby well, where we would be getting water to drink and shower for the next few days. 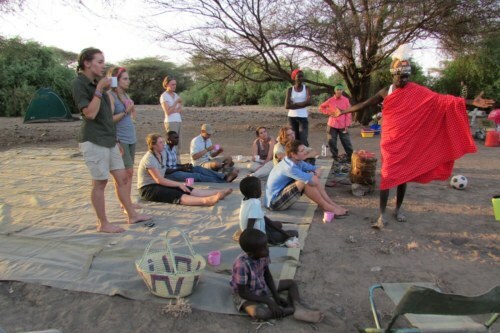 When we were finished setting up camp, Dr. Professor Harmand introduced us to Sammy Lokorodi, a local from Nariokotome who works on her team. In fact, Sammy was the first to find a Lomekwian tool that fateful day they were first surveying the area! Sammy was kind enough to explain, from his perspective, the discovery of the Lomekwian industry. Sammy tells the students about his discovery of the Lomekwian industry! 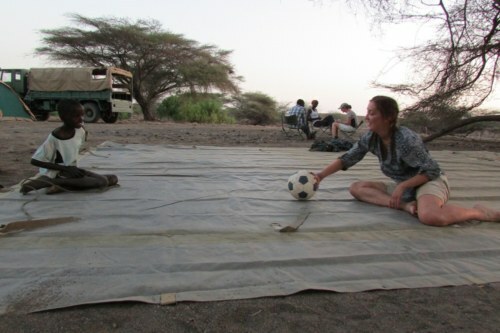 Millie passes time by passing a soccer ball with Dominique, one of the local boys. 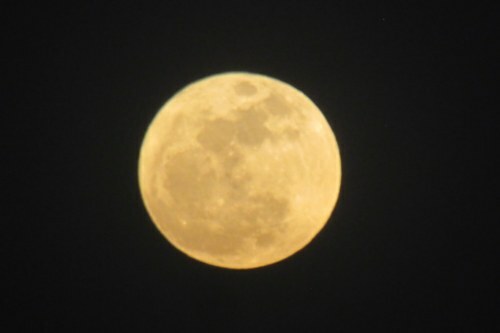 That night, we were greeted by a gorgeous full moon (in fact, it was both a blood and supermoon, adequately named given its color and enormous size). This picture was taken after the blood-red color had passed, but it was still amazing. PC: Emily Olsson. We spent the majority of the next day visiting several of the different sites at Kokiselei. 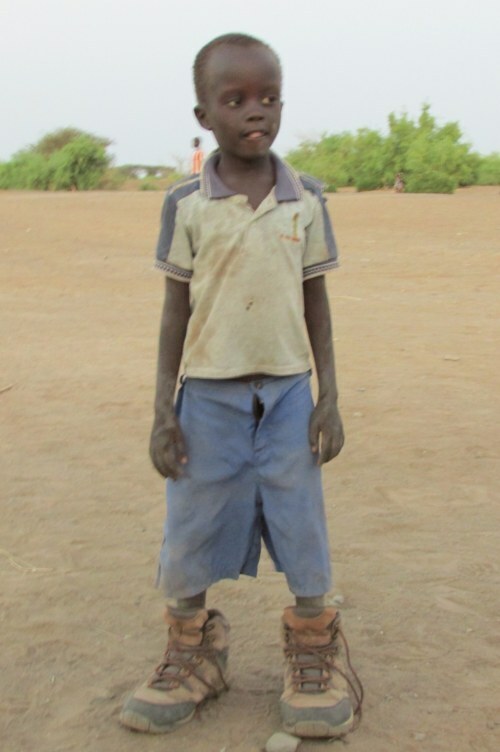 However, prior to our drive there, we stopped by the site of Nariokotome boy! 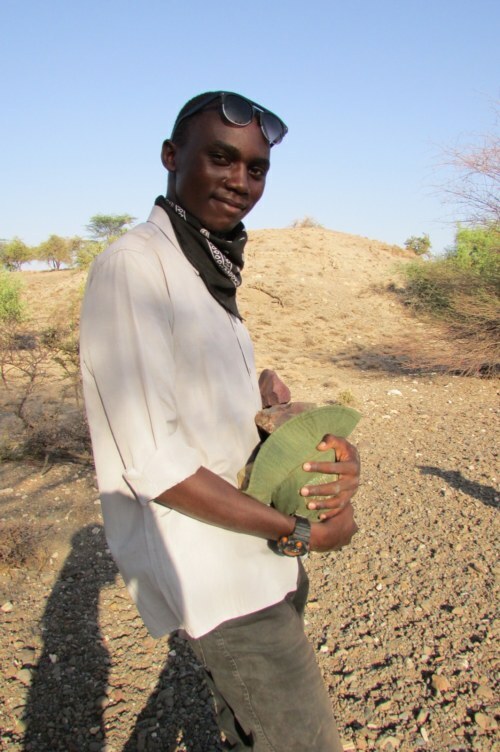 Francis, a TBI field assistant, is from the village of Nariokotome and was actually present back in 1984 when the fossil was first discovered! 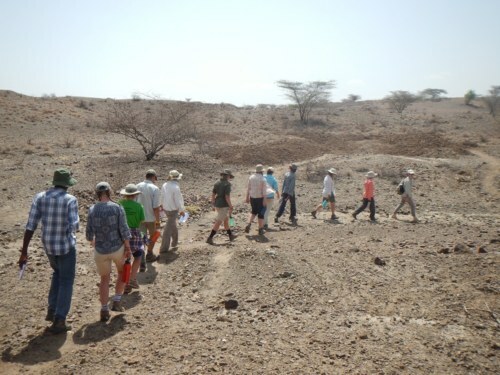 While at the site, he recounted his experience that day and told us more about the discovery. The students take a group picture by this very famous monument! Dr. 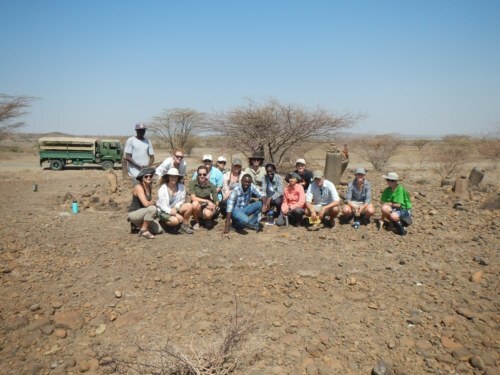 Professor Harmand brings the students to the excavation site where they found Nariokotome boy back in 1984! The mother of this local family keeps charge of the key to the gate that keeps this site protected! Before the team’s discovery of the Lomekwian industry, Dr. 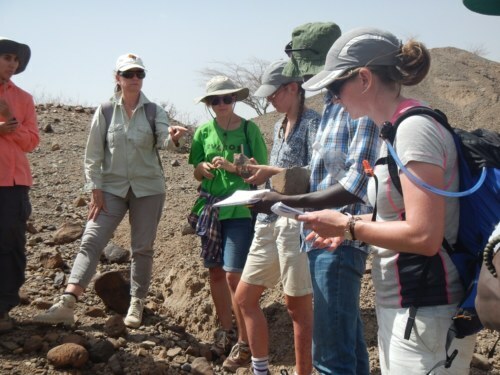 Professor Harmand and her team conducted several excavations at the sites of Kokiselei, where they discovered the oldest Acheulean tools at Kokiselei 4, dated at 1.76 million years. Though we would be visiting Kokiselei 4, we would also see several of the other sites that her team worked on in this area. 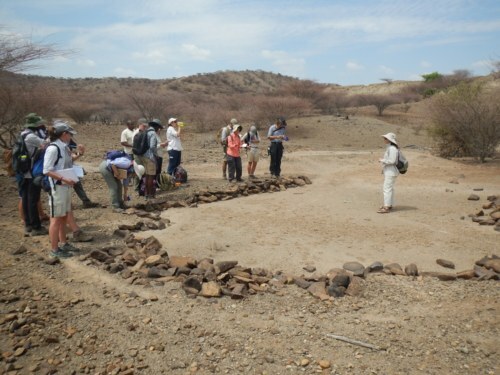 We first stopped at Kokiselei 1, a younger Oldowan site dated around 1.8 million years. 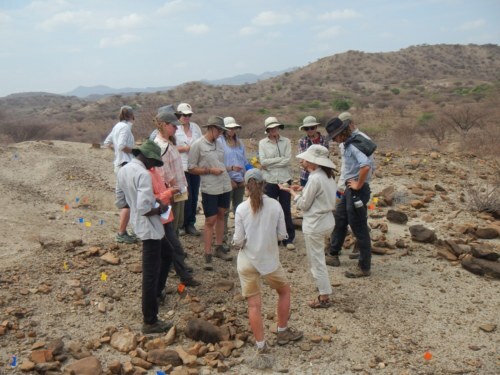 This site is characterized by a very high spatial density of artefacts, so the students spent about half an hour flagging as many artefacts as they could, again, discussing any confusing or interesting tools they found. Dr. 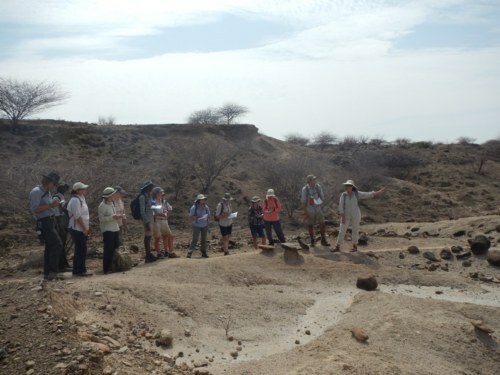 Professor Harmand shows the students where excavations took place at Kokiselei 1. 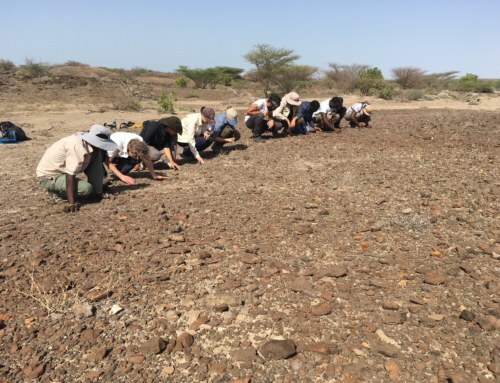 The students prospect for stone tools at Kokiselei 1. TA Jayde explains to Kathryn what kind of stone tool she found. 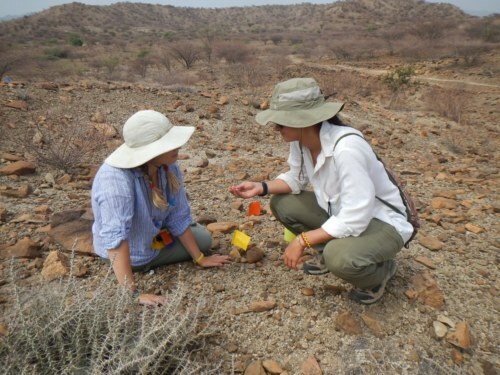 Millie and Emily look at a fossil that Emily found on site. 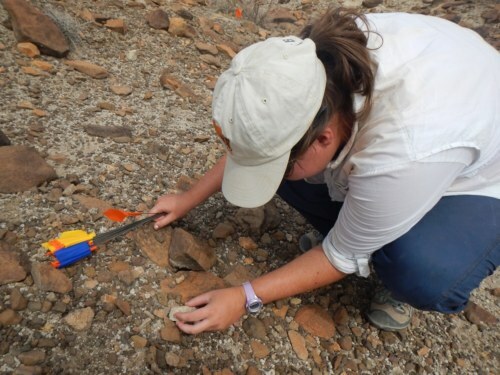 Morgan closely examines her find! Dr. 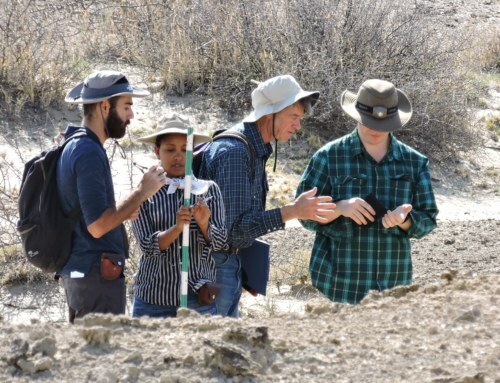 Professor Harmand shows the students a core that was found on site and the students pass it around to get a closer look. At Kokiselei 4, Dr. 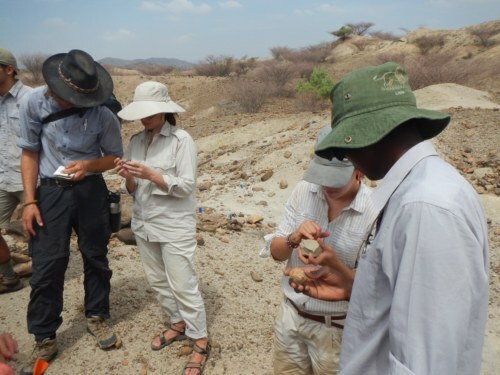 Professor Harmand explained that because this is the oldest Acheulean site, the tools are not quite as well made as are some of the later Acheulean specimen. 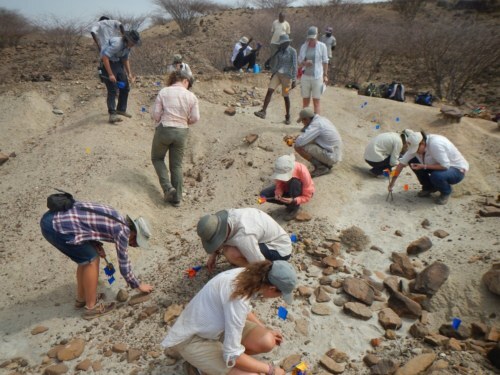 After further discussing this site, the students spread out to find some of their own Acheulean tools! Dr. 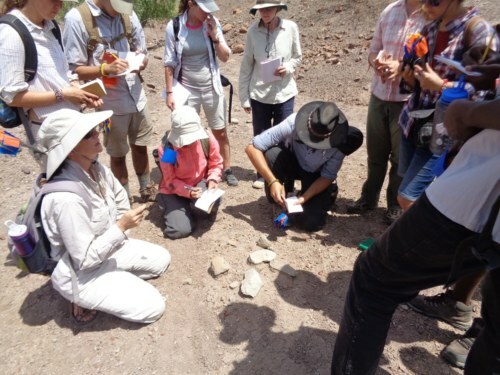 Professor Harmand introduces the students to Kokiselei 4, where there are so many bifaces you have to make sure you don’t step on one when you walk around! Dr. 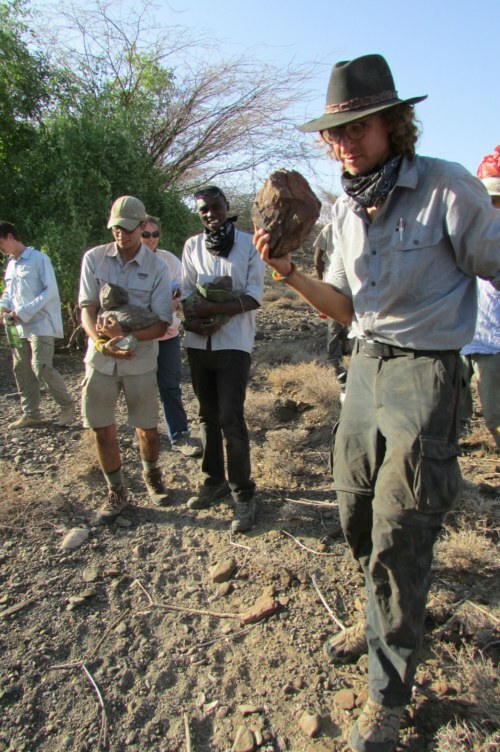 Professor Harmand shows the students a collection of stone tools found at this site. 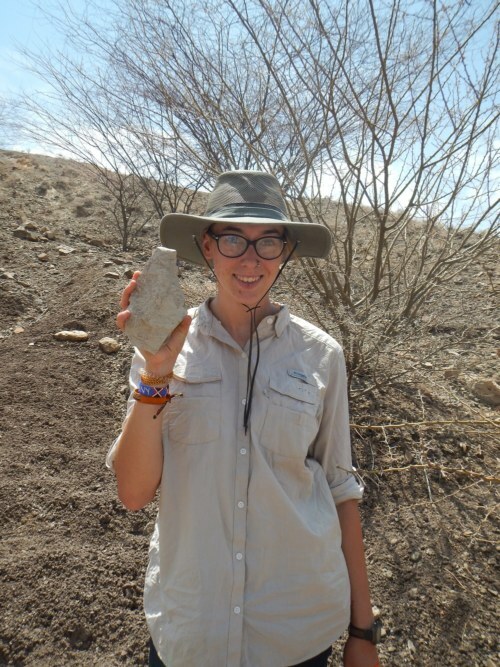 Yvette found her first stone tool! Dr. Professor Harmand brought the students to another site that they often refer to as the swimming pool because of its shape. Dr. 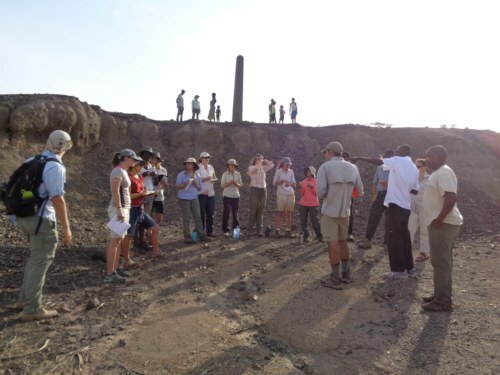 Professor Harmand explains how erosion has damaged the site of Kokiselei 6. After lunch, we collected raw materials for the knapping activity the students would be doing on Thursday. 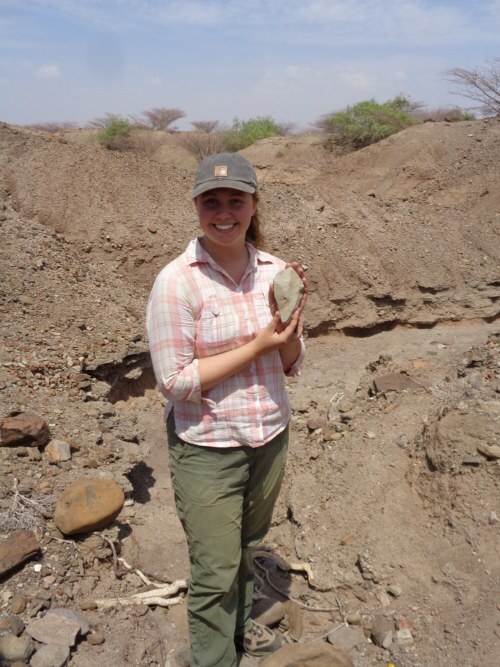 Students needed to collect a basalt hammerstone, and cores of both phonolite and rhyolite (raw materials that tend to be good for flaking and shaping). 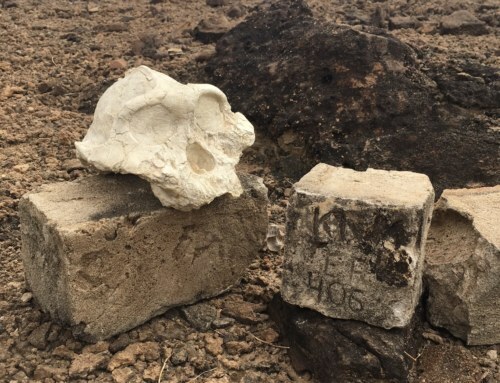 There are a few guidelines that can help when selecting raw material: hammerstones should be well rounded; cores should have good natural angles (acute angles allow for natural striking platforms), be fine-grained, and be able to be held in one hand. 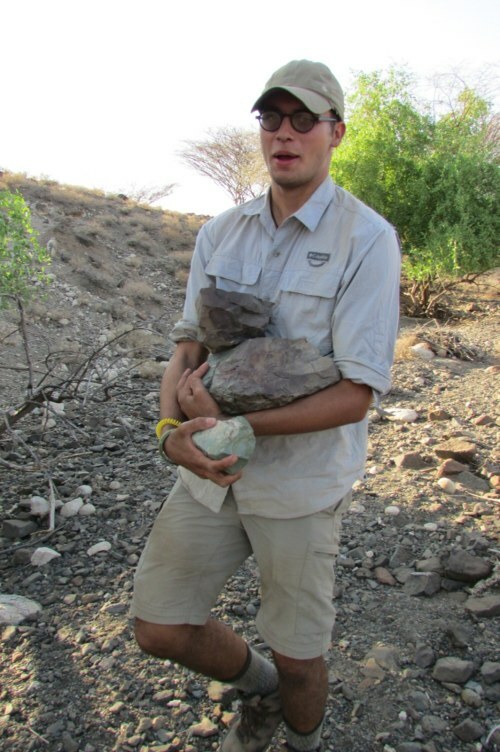 As the students soon realized, selecting quality raw materials is not as easy as just picking up rocks! Having to select their own raw materials really made the students think about the cognition of tool-making hominins: selecting appropriate raw material is just as necessary as being able to make a flake! Kathryn decided to carry her rocks on her head! Toby finds a lot of rhyolite to knap. Max searches for the largest rocks he can find. Look at that giant piece of rhyolite! 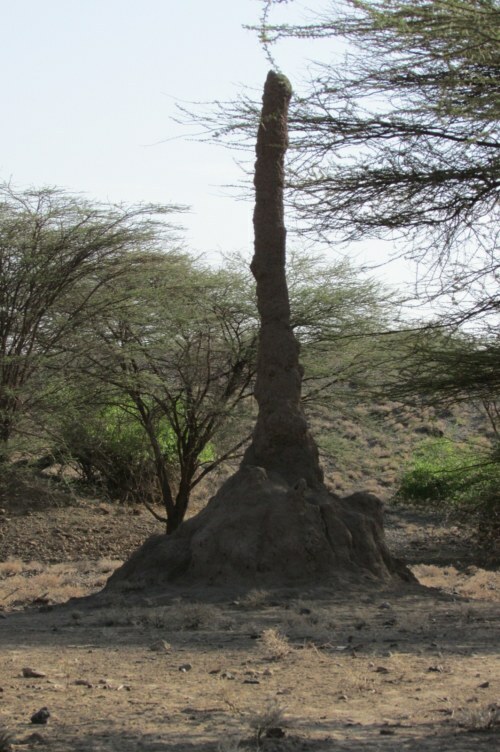 Large termite mound where we collected material. 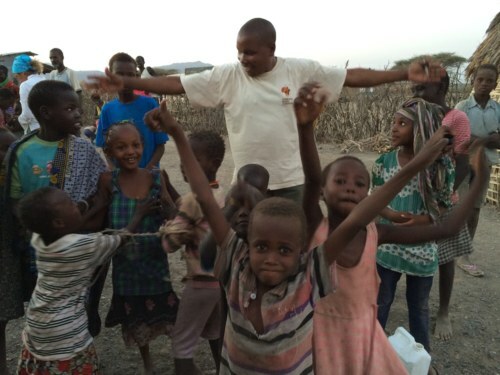 That evening, we visited Nariokotome village. 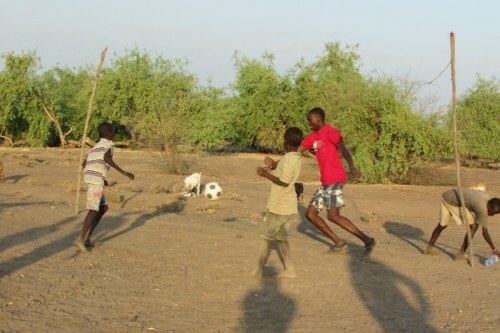 Some of the students played football with the locals while other students played with the local kids! It is always amazing to see how joy can so easily be spread across language and culture. Happiness was written all over the students’ faces on their walk back to camp. 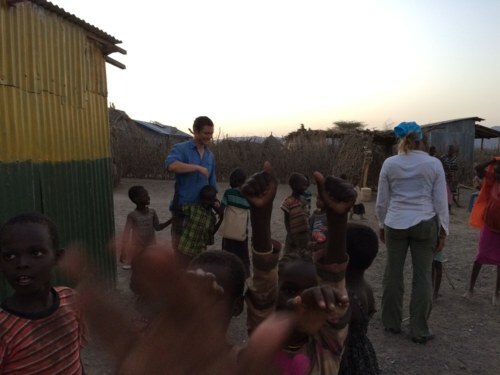 Toby playing soccer with the local children. 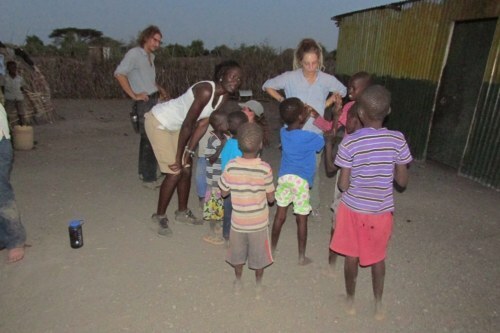 Esther, Kathryn and Jon all take turns playing games with the children. 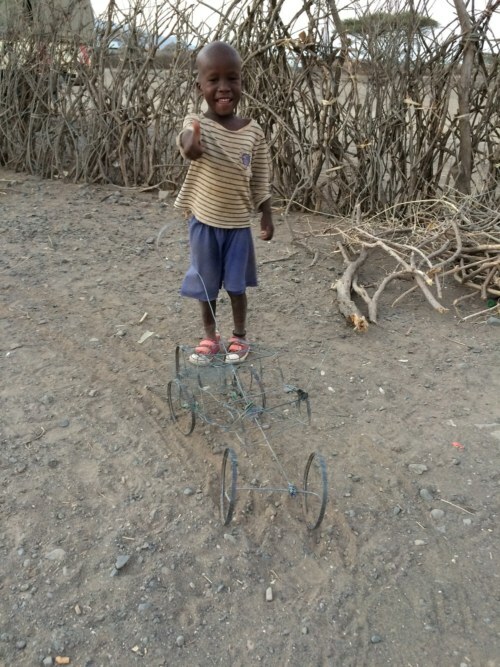 Look at that awesome toy car! TA Mattia plays with the children too! The children love taking photos!